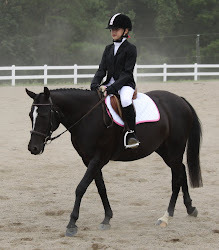 Dressage at Lexington was super fun. It is so nice to have such a solid horse who is so comfortable in the show atmosphere. This was our first bigger show, and we improved consistently thru the weekend. We ended our rides with a qualifying score for the regional championships at second level, even with a pilot error during one of our simple changes. The judges' comments were helpful and reaffirmed our immediate training priorities. It was also the first time Bruce and the kids went with me for the entire show and went thru the whole horseshow experience, which made it fun for me (hard for Bruce, I'm sure). There were a ton of people in the second level tests - many more than in training and first - which surprised me, but it is a great sign for the sport that people are sticking with it and moving up. I had lots of pros in my classes, so while we were out of the ribbons, I was happy with our first outings and thrilled to have such a cool guy in Barney to carry me thru! P.S. The hot water heater showed up after we pulled out of the driveway for the show, but it was so hot, I couldn't have stood a hot shower anyway!